Once a year we open our doors to welcome hundreds of visitors to our campus. In October, we invited families to tour our classrooms, science labs, maker space, library, and athletic facilities and get to know our community. 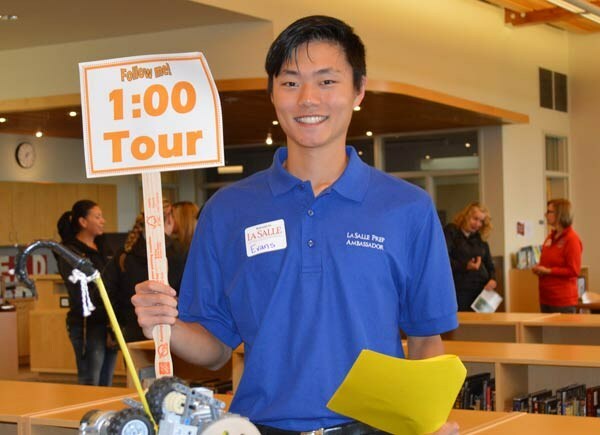 If you missed Open House, please contact La Salle for a private tour - all are welcome! Meet our students, faculty, counselors, and more - talk with members of our community and our Lasallian family. Understand how and why our Lasallian philosophy provides in outstanding and personalized education. Walk through our bright, engaging and interactive classrooms and science labs. Explore our MJ Murdock Charitable Trust Innovation and Design Center with hands-on learning opportunities with our laser cutter, 3-D printers, robotics kits, and more. Learn about our service activities, immersion trips, and travel opportunities. Understand how our iPad mobile learning initiative transforms learning for our students. Learn more about our impressive 5A athletics and check out the many championship banners in the Brick Oven. Imagine yourself as a Falcon! Current 8th grade students are also welcome to spend a school day on campus with a current La Salle student. REGISTER NOW to come and be a Falcon for a Day!